This annual bestseller ranks the hottest, must-visit countries, regions, cities and best-value destinations for 2019. 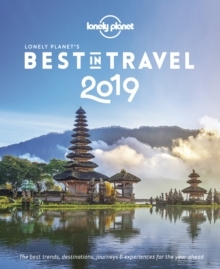 Drawing on the knowledge and passion of Lonely Planet's staff, authors and online community, we present a year's worth of inspiration to take you out of the ordinary and into the unforgettable. As self-confessed travel geeks, our staff collectively rack up hundreds of thousands of miles each year, exploring almost every destination on the planet. And every year, we ask ourselves: where are the best places in the world to visit right now? It's a very hotly contested topic at Lonely Planet and generates more discussion than any other. Best in Travel is our definitive answer. Inside Best in Travel 2019, you'll discover the:Top ten countries, regions, cities and best-value destinationsBest new attractions for familiesBest new openings and experiencesBest new places to stayTop travel trendsAbout Lonely Planet: Lonely Planet is a leading travel media company and the world's number one travel guidebook brand, providing both inspiring and trustworthy information for every kind of traveller since 1973. Over the past four decades, we've printed over 145 million guidebooks and grown a dedicated, passionate global community of travellers. You'll also find our content online, on mobile, video and in 14 languages, 12 international magazines, armchair and lifestyle books, ebooks, and more.